Located in Utah's Arches National Park, this most delicate of the famed arches in the area known as Devil's Garden could easily collapse under the natural forces that has formed it's unique shape. 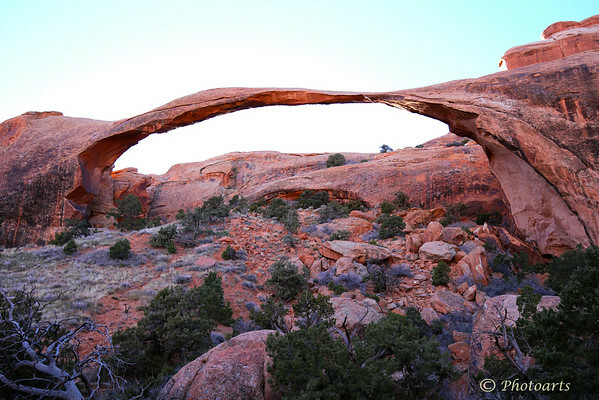 At 290 feet, it is considered second largest natural arch in the world, a true natural wonder! Fantastic capture, love the amazing rock formations and textures! Great shot of the arch! A true marvel. Enjoy it while you can, I guess. That's a wonderful capture of this lovely, and truly delicate looking arch. Outstanding! I have some shots of this arch, too. Good shot of this ephemeral arch! Great shot of the arch.